QUAKETIPS: Do you have a ticking time bomb in your cupboard? Better check what is supporting your shelves! If it seems like I can be fixated on kitchen cabinets, it’s because they frequently are not on the radar screen of people trying to prepare their homes for earthquakes, but there are actually multiple ways in which they can be vulnerable. You’ve read many references in this blog to keeping the cabinet doors from swinging open and letting everything fall out, with potentially disastrous consequences, by putting quake-proof latches on the upper cabinets. 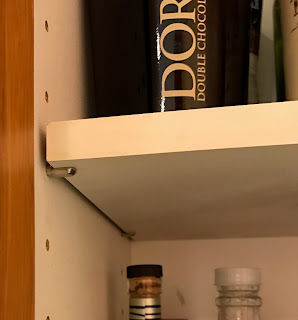 I also have occasionally mentioned that quake putty can be used to stick down rarely-used expensive wine glasses in the cupboards, since even if the doors don’t open, the contents can get knocked over and fly around and break inside the closed cabinets. However, there’s another potential problem, and some of you have it in your cabinets right now! Yep, those sturdy boards on which very heavy loads of dishes, glasses, liqueurs, etc. are sitting. Nope, I am not saying that the boards will buckle under the weight, but look for the weak link: what is holding the boards up?? In many cases, those boards are sitting on pegs that fit in holes on the inner sides of the cabinets. Multiple holes enable you to select the optimal height of the shelf. I’m not telling you anything you don’t already know... except that some of you have pegs that can spontaneously fail. Yep, it’s true! Here’s a true story from my own condo building. It’s a modern building that was opened in 2007, good quality. 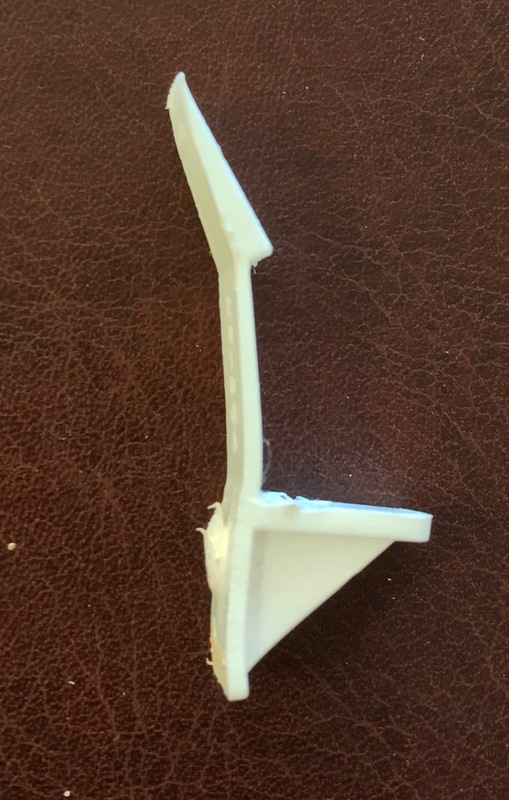 The shelves are supported by plastic pieces that sound like a great idea; they are not only pegs but they include a wide flat support on which the shelf sits, and then a thin piece of plastic sticks up next to the board and around on the top, clipping it in. That not only supports the board, but also stops it from sliding around. It turns out that it’s not as smart as it sounds. 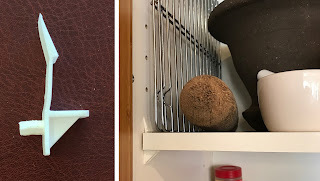 A few of my neighbors have had experiences over the last couple of years in which the plastic peg suddenly fails, shearing off where it sticks out from the hole, and people have had shelves and all of their contents spontaneously pancake down in their cupboards with a crash. In fact, a neighbor experienced this, got a whole bunch of metal pegs, and replaced the plastic supports with the metal pegs to prevent this from happening in the future. He had a bunch left over and gave me some so that I could do the same when I managed to get around to it, to prevent this from happening to me. Well, Mr. Preparedness here never got around to it. A few days ago, there was a clunk in the kitchen that I could not identify and I figured it was something shifting in the drying rack. Then a couple of days later, I needed to get a tall pot out of the back of the lowest shelf in one of my cabinets, and as I was pulling it out, it was scraping against the bottom of the shelf above it. Since it’s never scraped before, I was very confused, and a few seconds after I pulled out the pot, that whole shelf, supporting lots of heavy serving platters and ceramic bowls, came crashing down! It turns out that the clunk I heard before was one of the supports giving way, and the corner of the shelf falling just a tiny bit onto the pot. When I pulled out the pot, the rest of the shelf gave way. As a result, I replaced the plastic gizmos with the metal pegs for all shelves that were supporting heavy and/or breakable objects. Fortunately for me, nothing broke. Ok, so anyone want to guess what this has to do with anything? Well, if everyone in my building has cabinets in which the plastic shelf supports are degrading over time to the point that they might spontaneously fail when they are not moving, what do you think is going to happen in a moderately-sized earthquake? Every shelf support that was going to spontaneously fail without an earthquake, say in the next year, is going to fail when the cabinet and contents start quaking! 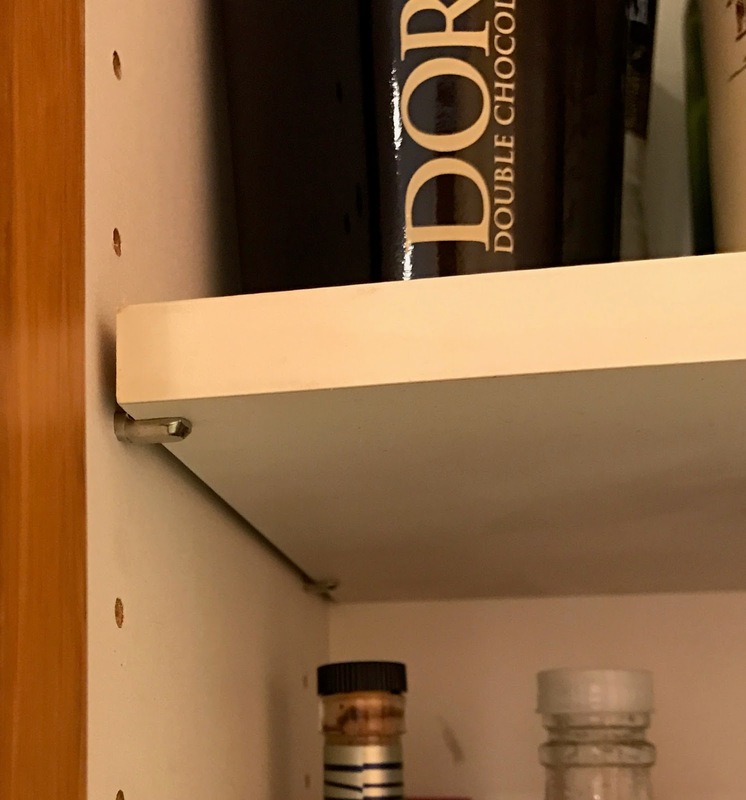 Cabinet doors stay closed, expensive wine glasses don’t fall over, but the shelves all pancake and everything breaks anyways. If my kitchen has plastic shelf support pegs, some of you have the same problem in your kitchen. You can prevent this Murphy’s Law scenario easily; just check what is supporting your shelves and if they are plastic, replace them with metal pegs before the next quake hits!